One of the great joys I’ve experienced in the past year-plus since launching this site has been getting better acquainted with Virginia wines. I still have a lot to learn — a lot — but moving beyond the previous marketing push for viognier as the state’s “signature variety” and exploring not only the myriad grapes that can and do grow in the state, but also the diverse mesoclimates the Commonwealth offers for viticulture has been as rewarding as it is fascinating. One winemaker who has enabled this exploration is Ben Jordan from Early Mountain Vineyards and Lightwell Survey. 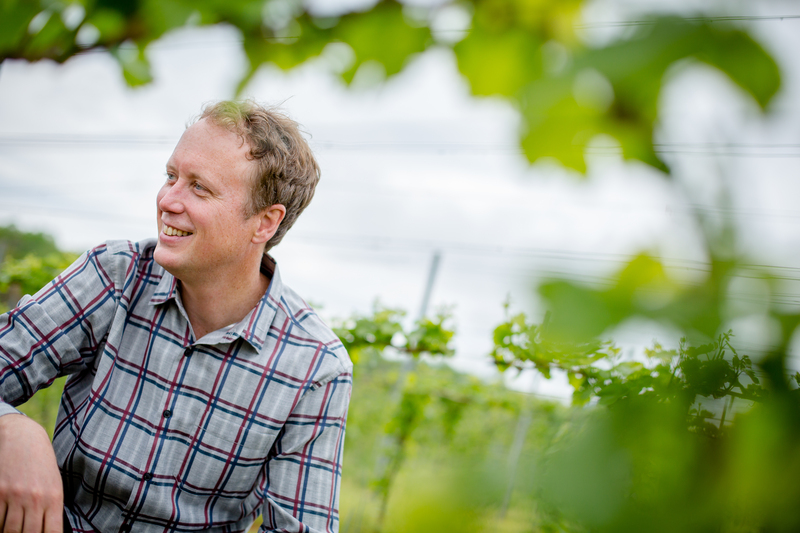 There are a lot of very talented winemakers in Virginia, but Ben’s thoughtful, experimental, dare I say terroir-driven, approach to winemaking makes him one of the best. Some of my favorite wines – from anywhere — of 2018 were coaxed to their deliciousness by Ben. Plus, we realized throughout the course of this interview that we both went to Carnegie Mellon University in Pittsburgh, PA for graduate school — though we weren’t there at the same time. I can think of no winemaker more deserving of being the first Cork Report Tastemaker of 2019 than Ben Jordan. Learn just a bit more about this playwright-turned-winemaker. Title: Winemaker at Early Mountain Vineyards and for Lightwell Survey. Winegrowing partner with my brothers in Fort Defiance. Before I Became a Winemaker: After college, I moved to San Francisco and worked as a bike messenger, then got a playwriting MFA in Pittsburgh and moved to New York, as want-to-be-playwrights do. There I fell for wine and started working with it, first in retail. I moved back to San Francisco and worked for a mostly-French wine importer, and then moved to Sonoma County where I started in winemaking. I was born and raised in Virginia, and I came back in 2012 to work for Michael Shaps as his winemaker at Wineworks and to help with my family vineyard, which we first planted in 2007. I started with Early Mountain in 2015. How I Ended Up Where I am Today: It was a circuitous route, mostly explained in the answer to the previous question, but here’s a little more: I fell for wine when I started selling and studying it, but it was the fact that my family has good wine grape land in the Shenandoah Valley that made me think I should learn to make wine. The short answer is that it was a mixture of trying to be a playwright and my grandparents and dad wanting to plant a vineyard. What I’m Drinking Right Now: I’m writing this after a couple of Thanksgiving get-togethers, so wine has been all over the place. My mom has a taste for Burgundy, so there was some of that. My brother and I are looking at what we should plant on our best soils (at higher elevation), so we tasted some Finger Lakes reds other than (cabernet) franc and pinot. Last night we finished off a bottle of Sonoma Coast syrah and some 2017 trocken riesling. The First Bottle of Wine I Remember Drinking: The first time I remember drinking wine was with a friend whose dad was a priest, and the wine was a big bottle of chardonnay we “found” in the church fridge, leftover from a reception. I drank the wines that set me on this path at my first retail job. I remember C&P Breton’s Les Galichets and Belliviere’s Rouge Gorge as realizations of how compelling wine can be. They were probably 2001 or 2002 vintages. My Winemaking Style: Evolving and open, leaning toward precision and purity. Because we are still in the exploratory phase in Virginia/Mid-Atlantic, and I am working across regions in the state, that means different things for different wines. Having control of the vineyard is the biggest part, but in the winery, it means being open to what wine the fruit can and wants to be, instead of starting with dogma or a stylistic goal. That is the easiest way to strip away inputs/remediation. The style can come after you start to understand the character of the grapes from a given site and region. Sometimes we are told that we need to focus on one or two grape varieties, presumably to make Virginia a marketable “region,” but also to hone our skills. I can certainly feel spread out with our different wines, but if you look at more mature regions, you realize everyone did this kind of work at some point. You only get to explore for a limited time before the market takes this freedom from you. If you are creative and open, the potential for growth in emerging regions is amazing. My Mentors — Wine and Otherwise: Erin Cressida Wilson for writing. Melanie Mann and Otto Han (in New York) and David Netzer (in San Francisco) for the sales and importing part. Webster Marquez, Paul Hobbs and Kerry Damskey (in California) and Michael Shaps (in Virginia) as winemakers that I worked with or for. Some of the people I have learned the most from are fellow winemakers and growers here in Virginia. The Music Playing in the Cellar Right Now: It’s quiet now, probably because the 2018 harvest was a loud and strange mix of interns DJ-ing some tough transitions between (deep) death metal, hip hop, country, and stand up comedy. Stand up comedy is challenging to listen to while making wine. My Favorite Thing About the Virginia Wine Industry: My favorite thing about the Virginia industry is that it is still early days and there is so much more building to do, and so many of the best vineyards have yet to be planted. This is coinciding with the wine drinking public being more open-minded, with fewer preconceived notions, so we get to embrace who we are. What I Wish Was Different About Virginia Wine: Imitation is at best flattery, and sometimes we forget to look for our own voice. I also think that we need to take sustainable farming and grape breeding more seriously. It’s a long-term investment, but Europe is both developing and embracing new disease-resistant cultivars while also pushing their farming practices. If we want to make a more natural product, we need to keep up, and breeding grapes to our place and climate will likely make the wines better and more affordable … to our children, when they farm them. On a Random Thursday Evening, You’ll Find Me Drinking: Generally there is an open bottle of riesling or a mineral, lees aged white. My Last Meal on Earth: Pizza and Champagne. Really good ones.